Someone not doing “the exercise” is a more interesting and generative tension than everyone doing it and three of those people wishing they weren’t. Especially today, i.e., in a cultural historical moment of increased attention to consent, power abuse, and social control/surveillance, when the studio, class, or performance experiment can be used to practice more complex and respectful relating or co-existing. 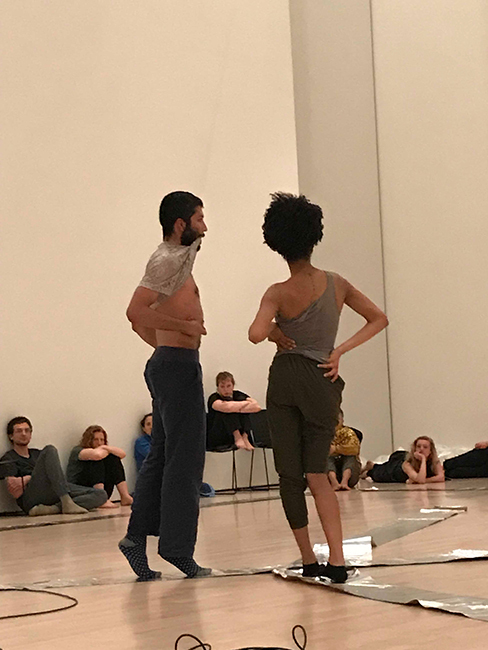 Let’s drop into bodily awareness, track our breath, notice who’s in the room, then start making, unmaking, improvising… considering all that influences an improvised action. 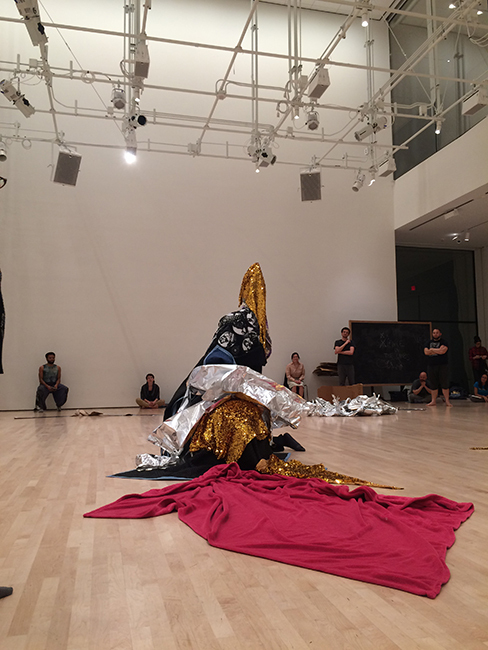 Forty-five people then improvised an environment/sculpture that filled much of the space using blankets, cardboard, plastic sheets, ropes, plum branches, still and moving bodies, gold sequined shawls, and other materials. Musical accompaniment: Bob Ostertag’s All the Rage/Queer Riot created through sampling and improvisation using sounds (crowds yelling, breaking windows at the State building) that Bob recorded at the 1991 queer riot in San Francisco after Governor Pete Wilson vetoed AB101, a bill that would have banned discrimination against lesbians and gay men in California. Who missed that we didn’t begin with a land acknowledgement? Original territory of the Ramaytush Ohlone. We are in San Francisco, a settler colonial city occupying several village sites including Yelamu. The Bay (maybe better to consider as an estuary, a fertile borderlands of land and sea, fresh and salt water) lined with village life and ceremonial sites that have left traces in numerous shell mounds. Many folks contributed comments, honors, remembering, histories including appreciations of Indigenous land stewardship, Indigenous rhythms, Indigenous survival, and local Indigenous leadership in particular the many contemporary women (Kanyon Sayers-Roods, her mother Anne Marie Sayers, Corinna Gould…) and Two-Spirit leaders who have inspired this moment. Two-Spirit artist Javier Stell-Fresquez reminded us that Ohlone people did not exist in a tribal vacuum but in relationship to the many nations, communities, and languages in nearby regions including, but not limited to, Pomo and Miwok. The Sogorea Te’ Land Trust is an urban Indigenous women-led community organization that facilitates the return of Chochenyo and Karkin Ohlone lands in the San Francisco Bay Area to Indigenous stewardship. The land tax encourages non-Indigenous Bay Area residents to acknowledge the history of the region (the entire East Bay) and the Ohlone community. It is a form of reparations and solidarity. 3. A racialized history of the Bay Area; how did we get here? Extending the practice of land acknowledgement and in an effort to better understand how we got there, meaning how did we get to the current racial demographics, racial segregation, racist structures and infrastructures that impact everyone in the room, our artistic practices and access to resources… How do racial policies and crises inspire and generate artistic production, social movement, structural oppression? Chinese Exclusion Act (1882), which banned Chinese immigration, following the Page Act (1875) which banned Chinese women from immigrating. These were the first laws created to prevent all members of an ethnic or national group from migrating to the US. The law was changed in 1943 when China allied itself with the US, and then was officially changed in 1952 with the Immigration and Nationality Act. Executive Order 9066. Japanese Internment during WWII, beginning during 1942, which treated US citizens of Japanese descent as alien enemies. Then declaring SF’s Japantown a.k.a. Little Tokyo as a “slum area.” The Black community was expanding into that area of the Western Addition, creating a “Harlem of the West” in the Fillmore corridor. WWII had an enormous influence on Bay Area economies, racial demographics, and infrastructure. WWII was an important source of jobs in the shipyards influencing a mass migration of unemployed or underemployed folks from the South, especially Black Americans fleeing Jim Crow. The most concentrated Black neighborhoods or regions in the Bay Area were in the areas with the most active shipyards: West Oakland, East Palo Alto, Bayview/Hunters Point, Richmond, Vallejo. Despite the economic and social potentials for Black people the Bay was also an inhospitable place, marked by anti-Black policies and social practices in the areas of redlining/bank mortgages, police profiling, access to schools and healthcare, union activism (some were anti-Black, others more internationalist). I also talked about Urban Renewal, a nationwide government policy intended to gentrify and break-up predominantly non-white neighborhoods. In Black communities Urban Renewal was often called Urban Removal because of the widespread eviction and dislocation it caused, pushing Black people from central areas of the cities to the peripheries. In San Francisco Urban Renewal was most brutal in the Fillmore, one of the more important Black cultural neighborhoods in the US, and in SOMA/Manilatown, an area densely populated by Filipino people, communities, and social organizations. The area of SFMOMA/YBCA/Moscone Center is built on the ruins of a thriving neighborhood, including many houses and SROs (single-room occupancy hotels) populated by poor and working people. Indian Termination policies of the US government from the 1940s through the 1960s, whose goal was to break up tribes and force assimilation. One of the results was thousands of Native folks being disconnected from land and community and moving to cities. San Francisco was one of the primary locations of relocated Indigenous people (as well as Seattle and Minneapolis), including children separated from their land/communities by residential schooling. Indian Termination was a continuation of genocidal policies that peaked in California during the 1849 Gold Rush. What was new was a sense of urgency to terminate the tribes and tribal identity. When we look at the non-local Natives who led the Occupation of Alcatraz (1969–71) we see the results of urban migration, dislocation, and attacks on tribal unity, in the coming together of Indians of All Tribes. The official termination policies only ended because of the political movement generated by the Occupation. WWII also generated many gay/queer migrants who, upon leaving the military, stayed in San Francisco rather than return to places with no visible or underground LGBTQ culture. A significant population of Native and Black vets also chose to remain in the Bay after their enlisted period. Later in the workshop we acknowledged the role of the wars in Central America in the ’80s, in which the US was always on the wrong side, against the liberation movements of El Salvador, Nicaragua, Guatemala, and for the capitalist/imperialist/anti-democratic regimes. These wars produced not only a large influx of migrants and refugees to San Francisco but also inspired fierce resistance movements centered in the Mission and other parts of the Bay. Augusto Boal — author of Theatre of the Oppressed (1979) a book that summarized and critiqued the primary Western performance tactics (mimesis, Greek drama, catharsis, Brecht…) to advocate for a new political aesthetic in which the audience becomes the actor. Boal was heavily influenced by Brazilian educator/theorist Paulo Friere, whose book Pedagogy of the Oppressed (1968, 1970 in English), played a major role in alternative education movements around the world in the 1970s. 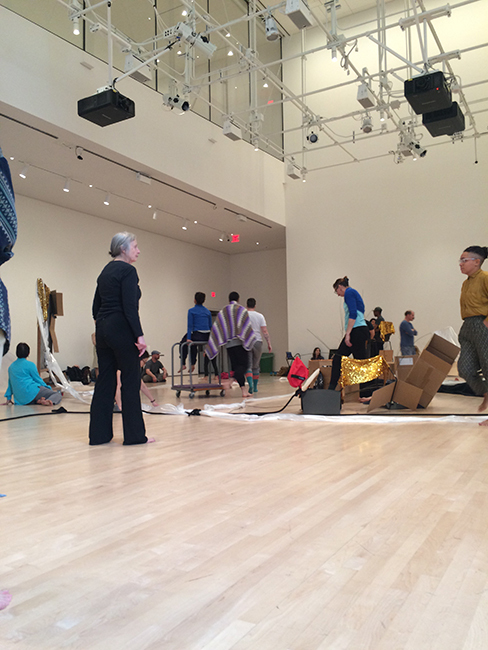 To support his work in communities where theater was either unknown or rare, Boal produced a manual for warming up “actors and non-actors.” All of the exercises or games include a physical or embodied component as well as a conceptual component that provoked awareness and consideration of power. For more exercises see Boal’s Games for Actors and Non-actors (1992). A Boal game for two people in which one person aligns their face with their partner’s hand, maintaining a parallel relationship with both the proximity to the hand and its vertical orientation. The goal is to bring your partner into unusual embodiment while also testing the bounds of leading/following in a strict power dynamic. After two rounds of the game we repeated the exercise with an imaginary partner. If you can’t visualize a hand, pretend you see a hand. For those who weren’t there imagine forty-five people highly focused on following an imaginary hand around the room for five to ten minutes. The exercise reveals how improvisation is more complicated than simply doing what one wishes or being free, and that physical and social structures (politics!) are implicated in our play, imagination, and freedom practices. 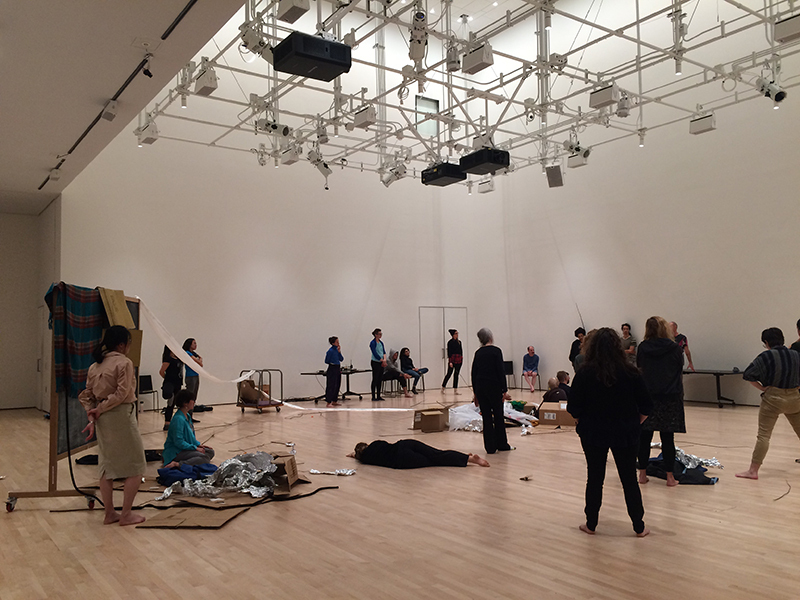 Improvisation as freedom practice — playing with and expanding the boundaries of language, structure, tradition. Moved by spirit, inspired. I talked about the histories of Black Americans that have been a primary influence on notions and practices of improvisation; both the blues and jazz practices of “riffing on a standard,” i.e., taking a traditional or widely recognized song and playing in and around it, and the “making do with what you have” practices of Black southern quilt-making, notably the Gee’s Bend quilters, who improvised with worker’s clothing, and whose masterpieces resonate not only with fabric traditions in West and Central Africa but with minimalism and many other modern and contemporary aesthetics. Randy Reyes and Stephanie Hewett in performance. Each week I present some artists from Bay Area art and activist histories. This week, instead, we will meet some artists making history. A lot happened watching Randy and Stephanie — dancing and pulsing to club music, wandering through the space and their consciousness, drinking and drooling water, commenting on the situations as they became aware of them, and then constructing another world, a strange or queer world, with foil, Christmas lights, darkness, and their own bodies in proximity. Sharing a practice I started to develop with Scott Wells (Touchy Subjects, 2016) and have continued to expand in several works since then. Two or more bodies make a shape that can be sustained for two to three minutes. When the sculpture making stops, the bodies slowly dissolve until they are flat on the ground. Before the energy has completely drained from the image, a new sculpture begins. I spoke about some of the ideas that led to this work, including a focus on the constant friction between representation and abstraction, especially in dance. How do we see movement without over-seeing the particular bodies doing the movement? I mentioned dance and theater, including my own, that has used masks and other ways of masking/hiding the person, the dancer. 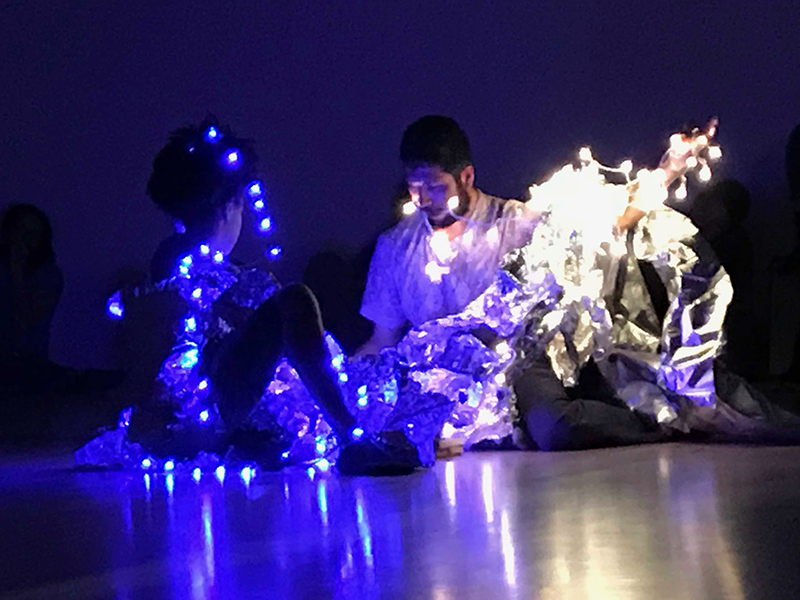 We considered structure and collapse, improvisation, collaboration, shared decision-making, letting go of control, dancers not seeing the outcome of their work… that is, creating visual moving art without focusing on the visuals. Interrupting all this talk about abstraction and aesthetics, Stephanie Hewett asked, “How will seeing this practice influence the ways that you see homeless encampments?” Many folks agreed that the exercise reminded them (hauntingly) of the improvised or makeshift homes and shelters we see all around us. We had a brief closing circle with comments by Stephanie and Randy. This event was mostly improvised. These notes document all that I can recall. During the racialized history of the Bay Area segment there were many comments and contributions from participants in the room. 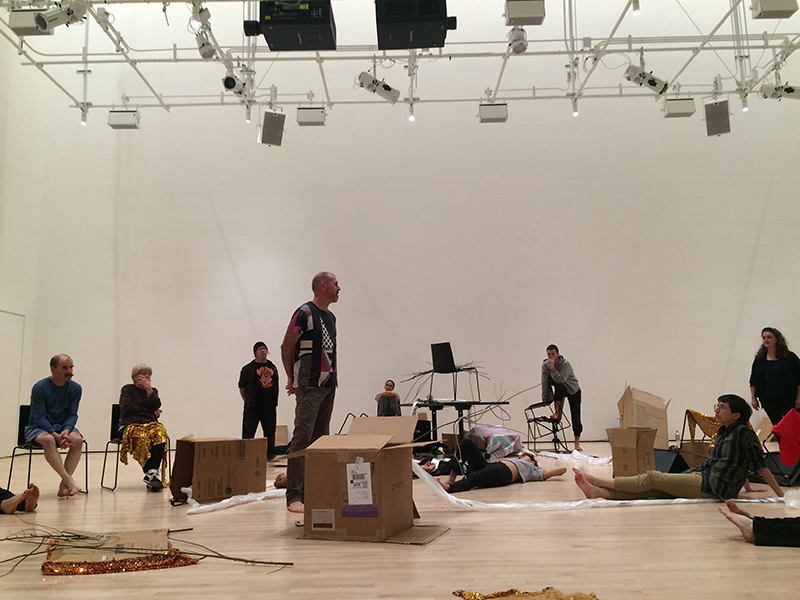 A lot happened in the group’s play with objects, both the initial space creating and the dissolving structures, but we didn’t talk about it very much.